Children of Thorns, Children of Water is set between two novels - The House of Shattered Wings and The House of Binding Thorns. It was a preorder reward for The House of Binding Thorns, and was then made available for free online in issue 17 of the Uncanny Magazine. It has now, deservedly in my opinion, been shortlisted for the 2018 Hugo Award. Dragons, creepy magic, cooking (!). Jo Walton is a Welsh-born writer living in Canada. She has won a wide range of awards for her writing, including but not limited to the John W. Campbell, Prometheus, World Fantasy, Nebula, and Hugo Awards. I used to think of her as an SF Poet, but looking at the list of her publications (and awards for them!) I very much stand corrected. Still, per her statement above, the one thing she struggled with were short stories, which is rather different to how many (most?) 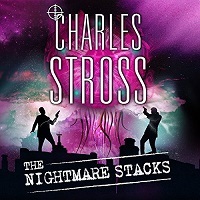 other SF writers hone their craft, and move into the field of published authors. But, as they say, different strokes for different people. And here we have, within her own definition per the above quote, her first collection of short fiction. 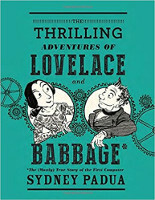 This is followed by an introduction, by the author, on the topic of herself, and her approach to writing short stories. I guess I can safely summarise this as not her forte, but she’s better at it than she used to be. Reading the collection I can confirm that she definitely does just fine with the format, even if she does not think of most of the contents here as ‘short stories’ herself! Most to all of the content has been published before over the years, so unless you are completely new to her oeuvre you will most likely trip over the odd story or poem you’ve seen before - I did, occasionally. I’ll provide short capsule reviews on topics and my impressions for the individual stories below - if you’d rather enjoy this without too many spoilers then you might want to stop here, and go get the book, it’s worth your time and money! Here's a blast from a past, and a great hope for the future, all in one package! 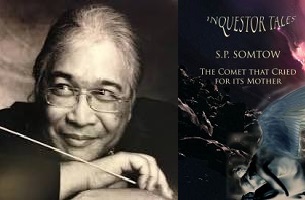 S. P. Somtow (or Somtow Sucharitkul, which he originally published under), the Thai/American polymath famous for both his writing and as a composer, has re-released The Comet that Cried for its Mother, an Inquestor originally published in Amazing Stories and later, in adapted form, included in Utopia Hunters on Wattpad. So, firstly, go forth and read, and enjoy - I always appreciated the Inquestor stories for their fantastic Space Opera setting, mixed with a High Values/High Honour culture which could just as well be from a classic Fantasy setting, for its inspirational and evocative language and storytelling. 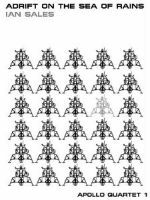 But, also - this is, as he states, part of the path toward a 5th novel in the series; which he plans to publish in Novella-length instalments as a Zine, with ancillary materials, original stories, and hopefully artwork. And me, for one, cannot wait to get my hands on new (or even previously unseen) material set in this universe. Bruce Sterling came to prominence as one of the superstars of Cyberpunk, a genre he helped to create and shape. But he has not rested on his laurels, and has continues to release novels, novellas, and collections - a lot of which explore societal themes, extrapolated from where we are today. These settings are frequently highly believable, both from the point of feeling like true possible futures, but also because they are vivid, with substantial amounts of incidental detail to bring them to live and give them depth. Distraction, an Arthur C. Clarke Award winner, is one such novel, centering on a US which has declined, turned inwards, lost its power on the international stage, and has politically fallen apart internally, too. The story follows Oscar Valparaiso, the former/outgoing campaign manager for Alcott Bambakias, the new Senator-elect for Massachusetts. Oscar is nominally taking a paid vacation with his Krewe, but is picking up a new project to occupy his attention in the shape of the Buna National Collaboratory, a Federal Laboratory and Genome Preservation Centre in Louisiana - including Dr Greta Penninger, a research-focused, non-political (in stark contrast to Oscar) neurologist who, to her own despair, serves as a Board Member. The relationship between theses two is as unusual as it is interesting in its development. The story plays out in a world where the US is not the world power it used to be - its economy went bust due to East Asia being faster, better, cheaper, and its military cannot pay its own power bills without setting up roadblocks to shake down travellers… American cash is no longer convertible to stable currencies outside the US borders (and larger bills are bugged, apparently). The cold war is now with the Dutch, over global warming and its consequences (yes the weather/climate has rather changed) - they literally are “with their backs against the dikes”, as Oscar’s former journalist girlfriend puts it as she sets off to cover this conflict from the Dutch side. Some of the other claims in the background are less likely or believable, like the changes to nutritions - fat and heavy cuisine has been made healthy as a reaction to the pesticide disasters which put an end to the diet and exercise movement, we are told. What do you get when someone deeply embedded in the Now, the discussions around our online culture, about our electronic rights, about where we are and where we are heading, and who has published copiously on these topics previously writes a work of fiction? The answer, for very good (and maybe even obvious?) reasons is with a cracker of a novel playing on exactly these topics - here is someone who knows what they are talking about, and who is telling us about what she feels we need to think of for the future. Annalee Newitz is a journalist who writes about the cultural impact of science and technology, the former editor at iO9 and Gizmodo, a policy analyst for the Electronic Frontier Foundation, and currently the Tech Culture Editor for Ars Technica. Besides all her online and magazine work she has 6 non-fiction books to her name, now followed by her first novel, Autonomous. Autonomous is a story about bots, about ownership, and about self-image and self-determination. Or, alternatively, about business, intellectual property, and the protection of investment; including the question of what is socially, ethically, and morally acceptable (or can be got away with, at least). The story, set in a 2144 which is surprisingly recognisable, follows two main protagonists - firstly Jack, a designer drug pirate who travels in a stealth submarine, and distributes free drugs to the needy who cannot afford them; and secondly Paladin, a bird-like bot, freshly become incorporated and thus indentured to the African Federation, who now is set to work for the IPC to track down patent violations. You see, this world is nominally run by a small number of power blocks, but all the more so by ever-mightier corporations, who more or less can flaunt the law as they wish in the protection of their interests; we witness some events involving violence I found rather unpalatable, but apparently quite accepted as fait accompli by society. Jack has a problem though - one of the drugs she reverse-engineered, has had produced, and sold to pay for her charitable work belonged to a mighty corporation called Zacity, and has a flaw - it does not just make work much more enjoyable and desirable to do (as it is designed to), it makes the user dependent on continuing to do it to the exclusion of everything else - to their death. And Zacity will do anything to keep this from becoming common knowledge.